Ronda Rousey has seemingly broken the proverbial fourth wall of professional wrestling once again. Per the latest updates on her personal website (rondarousey.com), Rousey is now promoting new T-Shirts with the phrase "Break Kayfabe" embedded on them. Additionally, "The Rowdy One" has also been promoting other designs, primarily aimed at furthering her on-screen heel character in WWE. Ronda Rousey is a former Strikeforce and UFC Women's Bantamweight Champion, and was recently inducted into the UFC Hall of Fame. Rousey is widely regarded as one of the greatest Mixed Martial Arts fighters of all time, and is considered to be one of the biggest box office attractions in combat sports history. The former Olympic medalist and revered Judoka made her long-awaited professional wrestling debut – joining the WWE's roster as an active Superstar on the WWE roster in January of 2018. Rousey eventually went on to win the WWE RAW Women's Championship, and performed largely as a babyface, before her recent heel turn – following which, the former UFC fighter has been portraying the role of an individual who hates professional wrestling and wants to expose the industry as 'fake'. As noted, the latest developments on Ronda Rousey's official website include the introduction of a couple of new T-Shirts in the "Shop" section of her website. 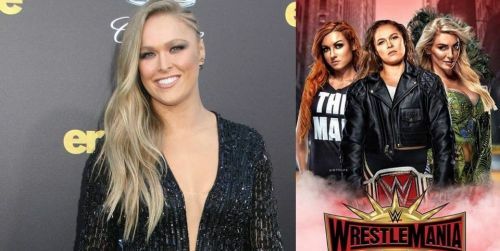 Fans can now purchase T-Shirts (available for both men and women), via Rousey's website – with the most significant one being the T-Shirt with "Break Kayfabe" printed on it. Furthermore, yet another T-Shirt design has the following statements nested on it – "Restricted: Under 17 requires accompanying mark or adult guardian. No respect for the business, breaks kayfabe, violence and language." WWE RAW Women's Champion is presently set to defend her title against Charlotte Flair and Becky Lynch in a Triple Threat Match at WrestleMania 35. WWE's WrestleMania 35 event transpires at the MetLife Stadium in East Rutherford, New Jersey on April 7th. What are your thoughts on Ronda Rousey continually breaking kayfabe, and magnifying her kayfabe-breaking actions at that. Sound off in the comments!